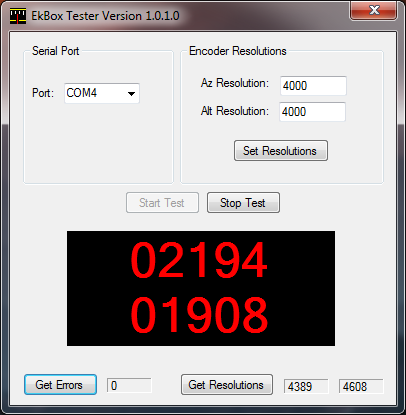 If you click the “Start Test” button, the EkBox Tester will begin reading and displaying the raw encoder positions coming from the EkBox. The numbers will be displayed in red as you can see below. The numbers will continuously update as you move the encoders until you click the “Stop Test” button. Note that clicking the “Start Test” button doesn’t automatically initialize the encoder resolutions–whatever resolutions are already in the EkBox will be used. If you don’t have any encoders connected, you’ll still see the red numbers but they will not change (obviously), but this is an indicator that things on the board appear to be working correctly. Once you’re finished, click the “Stop Test” button, or just exit the program by clicking the red X in the top right corner. Just a quick question. If encoders are geared can I use your tester to get the resolutions instead of having to take apart the scope to work out what the gear ratios are? Presumably it’s gear ratio times encoder res? If not is there a program I can use to obtain the resolutions? If the encoders are already mounted on the scope, then the easiest way would be to use the tester program. The way that I would do it is to first aim the telescope at a distant stationary object, centering in the field of view. Then start the tester app, set the encoder resolutions to a really high value (60000, maybe). Once set, note the initial encoder readings. Then slowly rotate the telescope, on only one axis, one complete revolution, finishing with your target object once again centered in the field of view. Note the final encoder reading. The difference between the final and initial reading is your encoder resolution. Repeat for the other telescope axis. Hope this helps — let me know how it works.